The best thing we can do in our special needs classes are to give them the opportunity to explore. Shaving cream is the PERFECT medium to do that with! During these classes there is little patience for long explanations, so we simply talk about using our imaginations and try to draw a shape we might see in the fluffy clouds above. 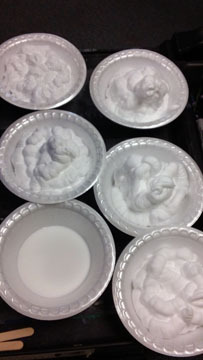 I mix 1 part white glue to 2 parts shaving cream in a small foam bowl and mix it well with a popsicle stick. 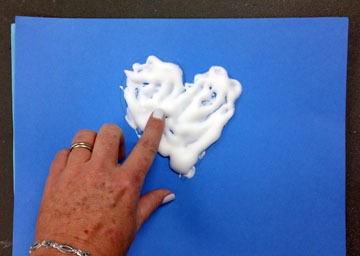 When it dries, you are left with a wonderful “foam” that doesn’t disintegrate like dried shaving cream does. The white glue acts as a binder. 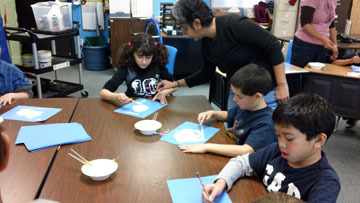 Using heavy blue paper as our “sky”, students draw their shapes with pencil. Someone had the wonderful idea of tracing around their hand and making a hand cloud. Some of our students need help with the drawing and tracing and simple is definitely better! 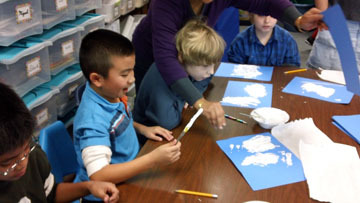 Using a coarse, stiff bristled brush, students then applied their “foam”, filling in the cloud with beautiful, fluffy whiteness! It is important that students “dab” their foam on. If you “paint” it on you won’t get the heavy application. I think more is definitely better than less! 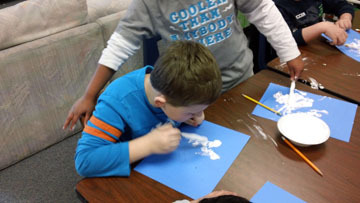 Clean up is a snap – there is nothing permanent about shaving cream and white glue and everything washes up easily. If you are doing another classroom right away and the bowls aren’t too messy they can be re-used. The foam won’t set up for another hour or so. When it does it develops a little “crust’ on the top that can be peeled away too. Later this year I will be doing this project in Kindergarten and extending the project to include visualization and how to “think” in color, as well as drawing themselves in the clouds somehow. Everyone loves this project!